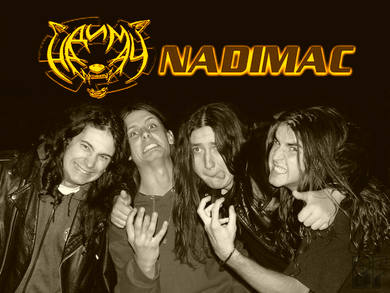 NADIMAC is a four-piece pure thrash metal band from Belgrade, Serbia. Founded back in 2003, two hairy metalheads dragan and zec wanted to play fast music, like German speed/thrash metal bands did. So far they recorded one demo album 〝Vukodlak Metal (Werewolf Metal)” and EP entitled “Metal Je Rat (Metal is war)” 2008/9 and they will be released on 4 split CDs this year with some fantastic thrash and crust bands in different parts of the world. 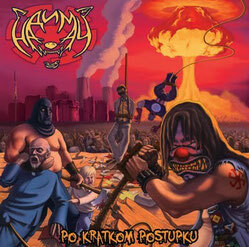 In 2011 the band has released their first album “Po Kratkom Postupku / speed retaliation style” from AREA DEATH PRODUCTIONS (China). They usually sing a song in Serbian. There are 3 songs they sing in English in this album. They have played for the first time in Greece, Bulgaria, Rumunia, and Bosnia also supporting bands like Sodom, Municipal waste, Accused and Warbringer. Their sarcastic and funny lyrics, old-school appearance, and the ability to provide a great overall listening experience helped them gain massive reputation in Belgrade underground scene. By now NADIMAC is known in region as pretty original and in a way unique band which tries to play thrash metal, but combines metal influences and also gives its own mark. Lyrics are always special part of bands music, sarcastic, funny, weird and everything but ordinary.